Bottom line: though I think I have the ability to be a spy (awareness, mental agility, creativity, etc. ), I would never be willing to pay the price for getting caught. So, no spy career for me. 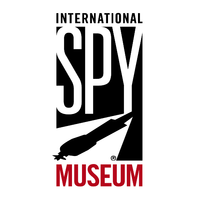 Aubrey and Scott and I visited the International Spy Museum yesterday, one of the items on our “must see” list. What a hoot. And I have to say, December is the time to visit museums in DC. No crowds. I don’t imagine I would have enjoyed the museum with a crowd around me, especially since the first few exhibits were interactive. When you first enter (after paying a reasonable $18/adult), you ride an elevator up two floors, where you are greeted by a staff member (yesterday, wearing a Christmas jester cap), who tells you that now is the time to choose your spy identity, memorizing all facts about your new identity so that your cover won’t be blown if you get stopped and questioned…and forget who you are and why you are there. My cover identity was Sandra Miller, a clothing store owner from Australia, on my way to Innsbruck, Austria, on a clothes-buying mission. I was 62 years old, American, born in Chatsworth, Indiana. I was enroute to Lederhosen Humphrey something-or-other (that gap in memory would have sunk me) to see Lena Gruen. From Gruen, I was to receive a catalog of merchandise, within which would be hidden microdots with confidential information. Too bad I was never stopped and questioned during my visit. Nor were Scott or Aubrey. But we were ready: facts memorized, nerves steeled, and vision acute for any suspicious characters approaching. Perhaps during the busier season they have people questioning visitors. That would be awesome! After choosing our identities, we were led into a theater where we watched a film about espionage and the risks entailed. The question was: do YOU have what it takes to be a spy? YES! Lead on! The first exhibit had several interactive stations, where we could gauge what kinds of security risks were shown in a variety of situations, where we could learn to spot “markers” for dead-drop sites and situations, and where we could test our memories about our covers. As I stood at one station, I noticed a large vent cover overlooking the station. Little did I know at the time what that meant. Later, as the three of us explored, Aubrey discovered that we could climb up into the vent shaft. Sure enough, from up there, I was able to look down on the station below where I had first seen the vent. Someone must have been watching me, to make me look up there! Ooooh, spooky! 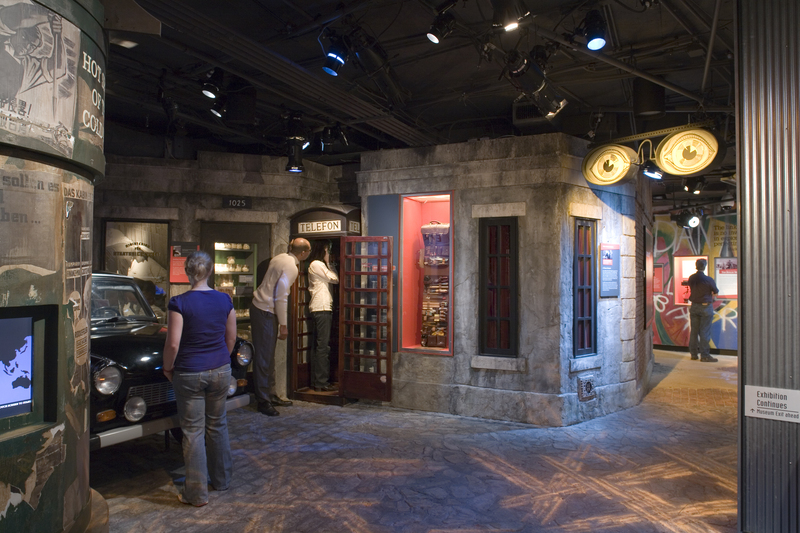 Throughout the museum, there were excellent exhibits about: surveillance, cameras, recording equipment, getaway vehicles, tools of the trade (lock picks and weapons), and so much more. But it wasn’t just about the tools of the craft. 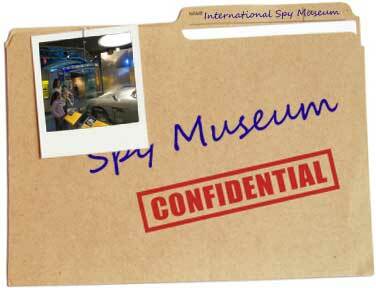 There was a great deal of history blended into the exhibits, from stories of real-life espionage and the spies who have hurt us (the U.S.), to exhibits about espionage through the ages. 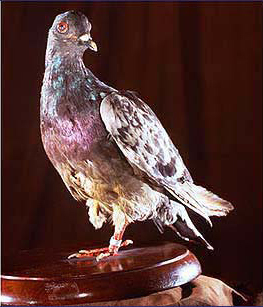 There was even an exhibit about Cher Ami, a homing pigeon with the U.S. Army Signal Corps in World War I who saved some 200 men of the Lost Battalion, and died in the effort. According to reports, Cher Ami flew over 25 miles in just 25 minutes to deliver his message despite having been shot through the breast, blinded in one eye, covered in blood, and with a leg hanging only by a tendon! The message was in a capsule on the damaged leg. For his heroism, Cher Ami received the awarded the Croix de Guerre Medal with a palm Oak Leaf Cluster. I particularly enjoyed the aerial view photos taken by spies in balloons during the Civil War and in World War I, as well as seeing the other methods by which espionage photos were taken. We spent almost three hours in the museum, and didn’t see it all. It’s definitely worth another visit. Next time, we might do Operation Spy (a live-action tour in which we get to prove our mettle as spies), or Spy at Night (intrigue, escape, and cocktails! ).